The Personal and Family Histories program is designed specifically for Early Stage One students. It focuses on the communication of students past and present, through stories of their own family heritage and learning about the heritage of others. 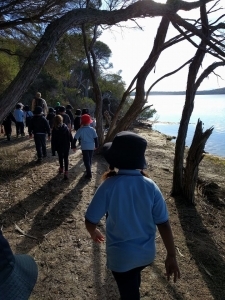 The learning experiences include a bushwalk where students discover the history of Bournda National Park and the creation of giant timelines to identify and sequence stages in their own life, and in the history of Bournda. They develop the skills of historical inquiry and communication by asking the question ‘How do we know?’ and by playing games where they need to understand and use the terms past, present, then and now. What has happened in our past? Using the text ‘Wilfred Gordon McDonald Partridge’ by Mem Fox, students explore the concept of a memory, and discuss the difference between the past and the present. Students then focus on their own past and present and identify and sequence stages in their lifetime. Students help by asking the question ‘What has happened in my past’ to help create a personal timeline. The students then create a timeline to represent the history of Bournda National Park. Each student has a prop and a noise / action to make to represent their time period (e.g clapping sticks for Aboriginal people). Each group of students find their place on a marked timeline on the ground. What has happened in Bournda’s past? Then and now – students are shown a series of photographs of items that are either from the past ‘then’ or the present ‘now’. Once they see an item they need to choose if it is from the past or the present and then run to the marked location of ‘then’ or ‘now’. Items can be discussed and students can see if they know the equivalent item from the past or the present. Timeline race – students get into small groups to work together to make their own timeline. Each student has to run to find a picture (e.g. a baby) and then work with their other team members to place the objects in order on their timeline. Family Fun – students discuss similarities and differences between families. Students share who is in their family. Each student is then given a picture card with a family member on it. Hoops are laid out and a number is called out. Students need to make a ‘family’ with only the correct (called out) number of people in it. Each time the game is played, many different combinations of family members are created. Students discuss how there are many different structures of families and family groups. 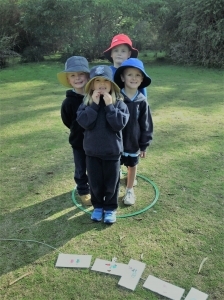 Knucklebones and skipping ropes – students play a variety of old fashioned games from the past. Old fashioned toys – students make old fashioned toys such as peg dolls.